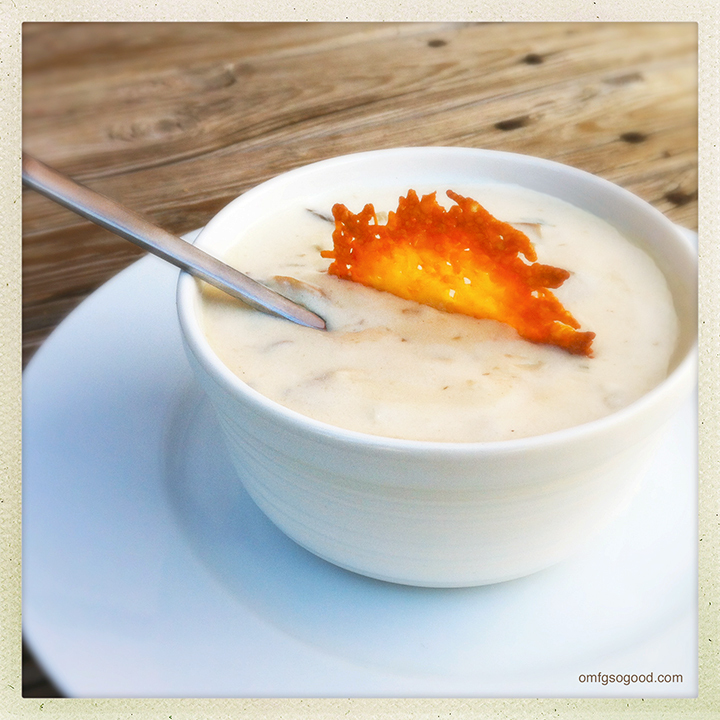 cream of mushroom soup with parmesan crisps | omfg. so good. if it tastes good, eat it. I loooooove mushrooms. Always have. Now, as an adult who can eat them in whatever I want, I’m confused when people tell me they don’t like mushrooms. Seriously? They’re so friggin yummy. Stuffed with cream cheese and sausage? Um. Yes, please. Sauteed with cranberries and apples, fried inside an eggroll? Sure. Bring it on. Baked into a pie with steak and gruyere cheese? Oh, hells yes. I could go on for days. But, my all-time favorite will forever be hearty, mushroomy, creamy soup. 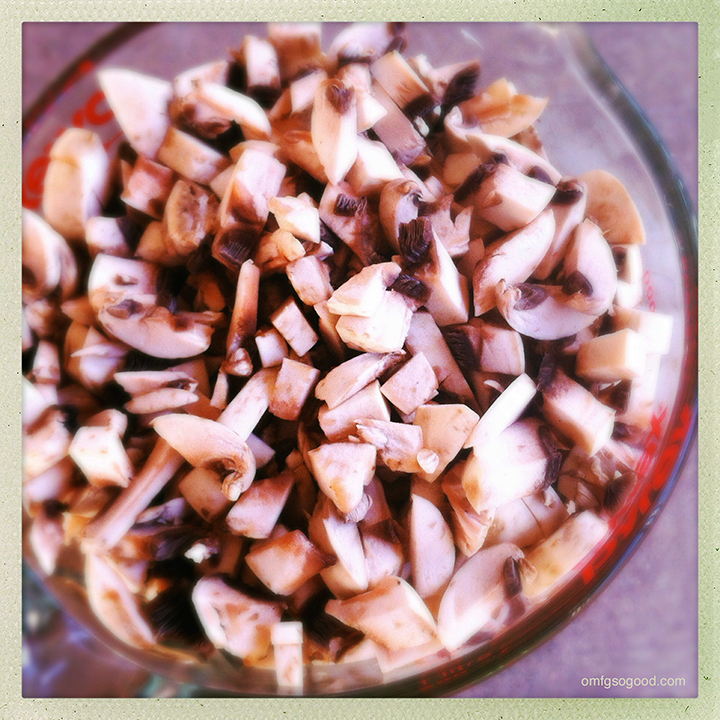 My recipe calls for straight-up, classic white button mushrooms. If you’re feeling highfalutin (I can honestly say, I think that’s the first time I’ve ever said that. And I had to Google it to make sure I was spelling it correctly, btw.) you can sub out with a combination of other, fancy mushrooms. I like the meaty texture of sauteed button mushrooms, though. Especially in soup. YUM. To make the soup, melt the butter with the olive oil in a large stock pot or dutch oven over medium heat. Add the chopped celery and onion, and saute until they soften (3 – 4 minutes.) Add the mushrooms and garlic, and saute until the shrooms darken and soften, then season with salt and pepper, add the flour and stir to evenly coat the veggies. Cook for another 4 – 5 minutes, stirring to loosen the good stuff from the bottom of the pan. Add the beef broth and stir to thicken. Bring to a boil, then reduce the heat to medium-low, add the milk and cream, and stir to combine. Throw the thyme sprigs on top and simmer for 15 – 20 minutes over low heat. Before serving, pull out the thyme sprigs, add the chopped parsley, and stir to combine. 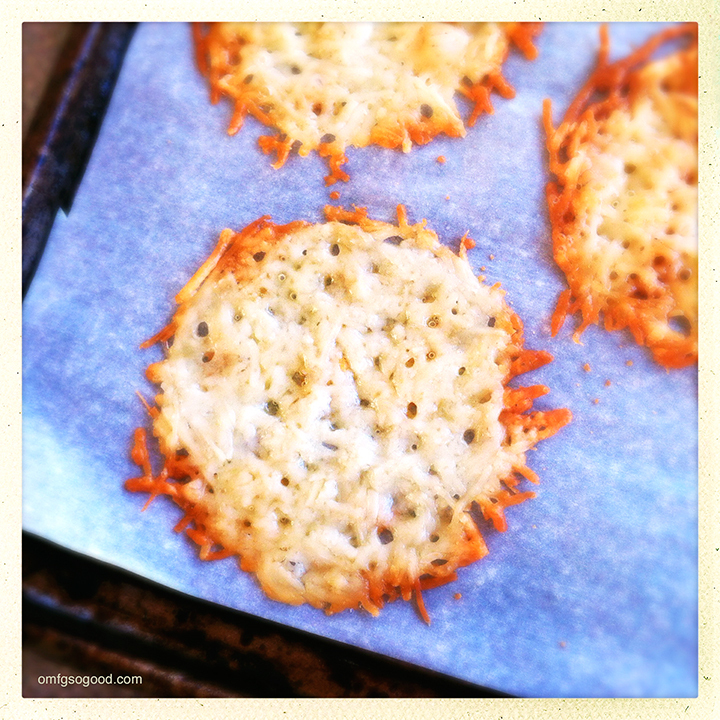 While the soup is simmering, make the parmesan crisps. Preheat the oven to 350 degrees and move the rack to just above the center. Line a sheet pan with parchment paper. 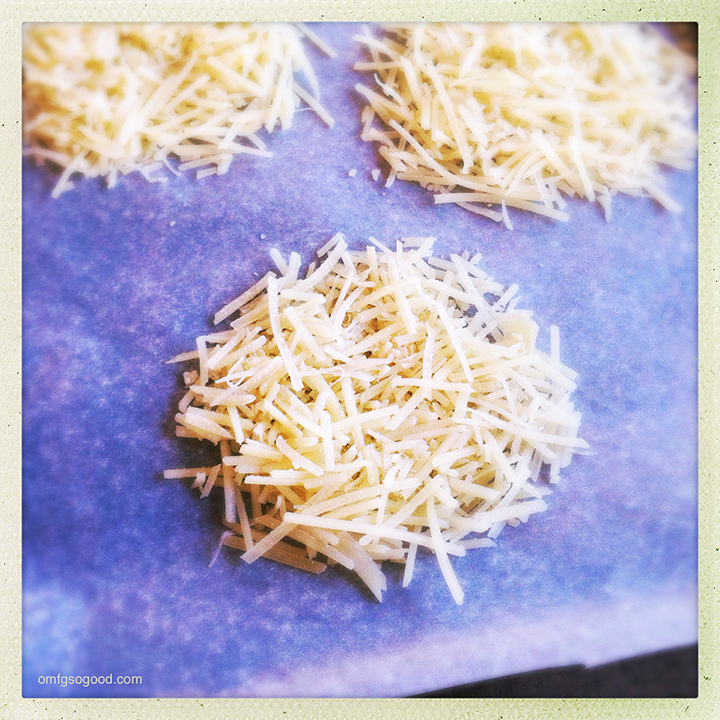 Drop 3 tbsp of shredded parmesan cheese in small, round piles, 2″ apart on the prepared sheet pan. Remove them from the oven and let them cool to room temperature on the pan. 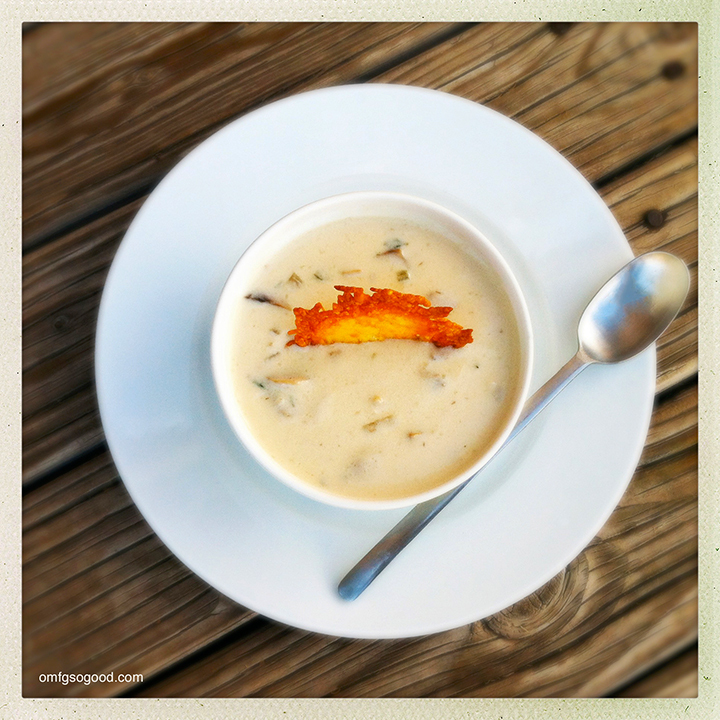 Spoon some delicious, shroomy soup into your bowl and top with a pretty little parmesan crisp.. The cheese will stay crispy on the edges, but melt to gooey perfection in the center. It’s like a grown up version of a grilled cheese sandwich with creamy, delicious soup. Minus the guilt of the white bread. Win. Win.